Valentine’s Day – whether you celebrate it or not it’s nice to spend some time with the one you love. When you are busy working and have kids to chase around you sometimes miss out on doing things for yourselves. So as we both had the day of this year we decided to drop into Seaworld for the morning. We have lived on the Gold Coast for 9 years now and first visited here in 1997. I have to admit we do love the theme parks here and have always had annual passes for one of them as they are so cheap to buy that way. Sometimes for locals you can pick them up for the same price as a day’s entry. At the moment we have VIP Passes which are for Movieworld, Seaworld and Wet ‘n’ Wild. As I hadn’t been to Seaworld for a long while we decided to go there for the morning in the hope of seeing the baby Polar bear, Henry and we weren’t disappointed. He was out with his mother Liya and put on a fantastic display of toddler-like antics. His favourite seemed to be lying on his back in the water, under a log and trying to get his ball. His mum even joined in on the antics from time to time. Born in May last year, he is maybe a quarter of his mum’s size and full of energy and mischief. I could have watched him for ages. Henry is a bit like a toddler – on the go all the time! For a large animal Polar bears are very agile in the water. Seaworld has undergone some renovations in the last couple of years. This has included an extension to Polar Bear Shores where Henry is housed. A new seal exhibit called Seal Harbour has been added. It has raised boardwalks all around the seal’s pools so you can see them swimming and sunning themselves. There is also a new penguin exhibit and a new ride called the ‘Storm Coaster’. It looks like lots of fun but you will get very, very wet on it! The new Storm Coaster looks like fun! Seaworld is famous for it’s dolphin show. They also have interactive dolphin adventures where you are able to get in the water with a dolphin. This is a great learning experience especially for kids. Even though Seaworld is a theme park their emphasis is still on education and conservation. Seaworld offers interactive Dolphin experiences. The new Seal Harbour attraction at Seaworld has great boardwalks right around it. After wandering around Seaworld for a couple of hours we headed off to grab some lunch. Just down the road from Seaworld you will find various dining options. They include the Palazzo Versace, Sheraton Marina Mirage Resort, Marina Mirage Shopping Centre, Peter’s Fishmarket which is well known on the Coast for great fish and chips and also Hog’s Breath Cafe, which is where we headed. 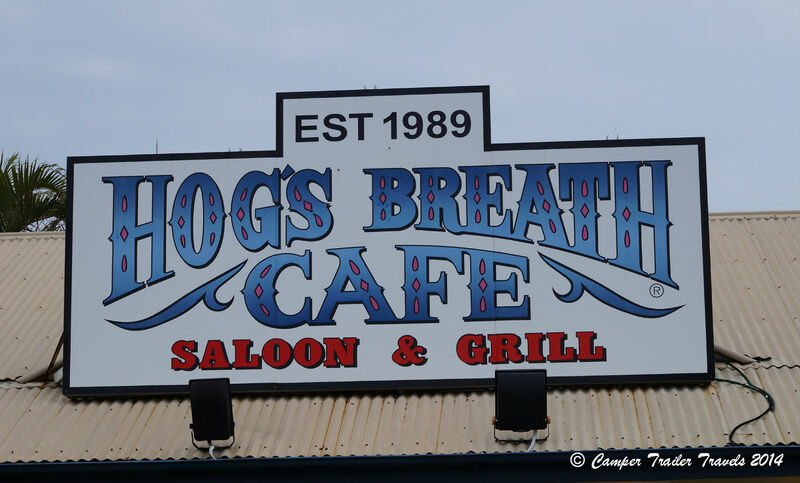 Hog’s Breath is a casual kind of a place and they serve up pretty good steak and ribs. We just had a burger and a wrap off the lunch menu which was really nice. So that was our Valentine’s Day – no camping but at least we had the chance to spend the day together. And I got some great photo’s too!